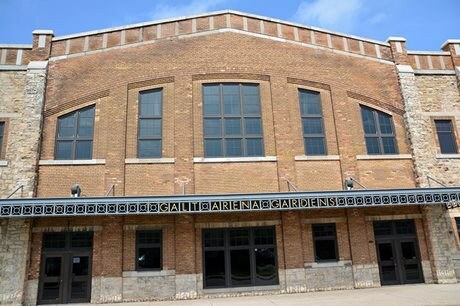 With hockey first played in the Galt Arena Gardens in 1922, this building is believed to be the oldest continually operating arena in Canada. The building was designed by architect F.C. Bodley to accommodate about 4,000 people – approximately one-third of the population of Galt – such was the growing popularity of hockey at the time. The Galt Terriers played in the arena, along with future National Hockey League legends Gordie Howe, Terry Sawchuck and Kenny Wharram. The Galt (now Cambridge) Figure Skating Club began operating out of the arena in 1951. Figure skaters Toller Cranston and Ron Shaver trained here during their early careers. The annual youth skating races that began 1931 still continue today, with almost every local child in the city having skated in the arena. Galt Arena Gardens was designated under the Ontario Heritage Act in 1997 following extensive renovations. Learn more about the architecture of the arena on the Building Stories website. See photographs of the interior of Galt Arena Gardens on the Roaming the Rinks website.